Carrie of A Lovely Little Wardrobe is a lovely little lady. I’ve gotten to “know” her through the Style Me Challenges. Here is what I know about her: she is stylish, strikingly beautiful, yet friendly, humble and helpful. 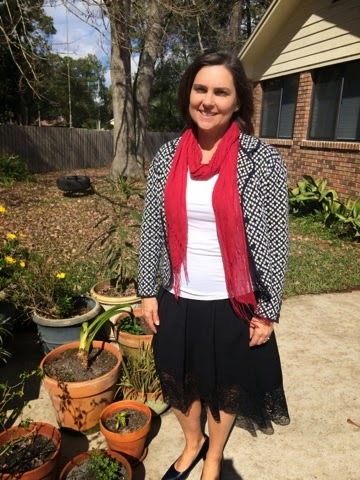 Carrie is hosting Create28 on her blog, which is a challenge to create 28 different outfits by shopping from your closet. She gives you several options on how to do this. I’m choosing the second one: create 28 different outfits using as many pieces as you like from your closet. I don’t think I could manage all of her prompts with only 28 different pieces! My wardrobe is not THAT flexible! Although I will not have a daily post, my goal is to post daily on Instagram with the #Create28BLovely hashtag. Then I hope to have a weekly recap to link up with the link-up she is hosting on Mondays. For Day One, she styled a “Favorite Go-to Outfit.” I changed it up just a bit. Hers was for a casual outfit. Since day one is Sunday, I went with a go-to church outfit. 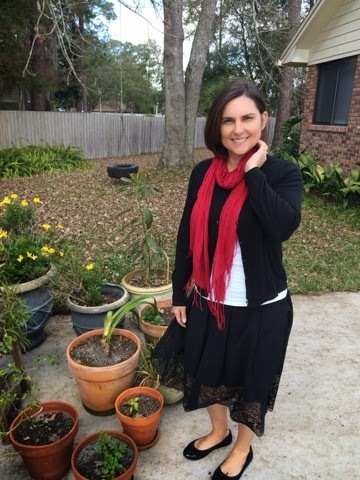 I will often pair a skirt with a simple layering tee and a cardigan (because even in Florida, I’m always cold in church!) and then add a scarf for some color. This is a prime example of my go-to church outfit. 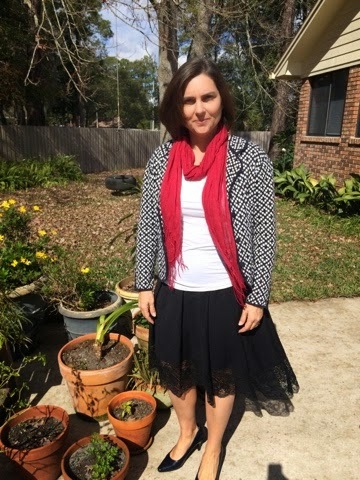 But today, I wanted to wear a new-to-me black and white polka dotted knit blazer from Talbots rather than my usual cardigan. 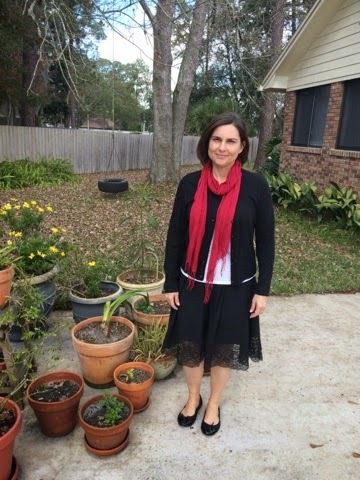 I kept the red scarf for color but I dressed up the outfit even more by wearing black heels rather than my standard flats. 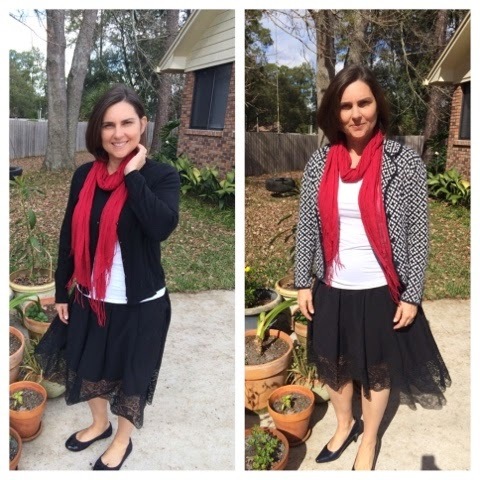 So here you have it: the before and after of my go-to church outfit! Sheila, thank you so much for posting this today! Also, I really like how you restyled this look. Great pattern and pop of color! Yay, for day 1! Thanks for doing this Carrie! I’m having fun! Hey Sheila! So glad to see you are participating in Carrie’s Create 28. I am going to try to play along now and then, too. I think your standard church outfit was fine, but safe. Of course, safe is a good thing for a church outfit, I guess. But the pizzazz your new Talbot’s jacket added was still totally church appropriate but more fun. Loved it. And the heels are a very comfortable height but add a little bit of sassiness or dressiness to the outfit. You are a pretty lady either way, but the new outfit just seems to be more fun. Thanks Leslie! Yes, the jacket definitely kicks it up a notch! I like that it’s knit…very comfy!